FOUNDRY “RETOOLED” now available on iTunes! We completed the album artwork for the new FOUNDRY album. It’s called “RETOOLED” and it’s a brand new take on some Steve Carlesi (Program Director for “The Opie & Anthony Show” on XM Radio) classic hits from the early 1990s. Steve was a session man for bands like Alice In Chains, Soundgarden and Weird Al Yankovic. No he wasn’t. But he did lay the groundwork for quite a few songs that would later go on to be rerecorded by Rich DeCicco! And for that we can all be grateful! 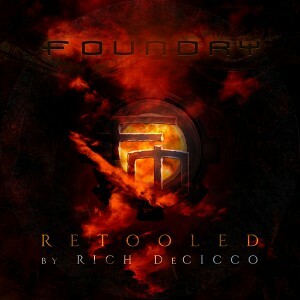 CLICK HERE TO BUY FOUNDRY “RETOOLED” by Rich DeCicco ON iTUNES! CLICK HERE TO BUY FOUNDRY “RETOOLED” by Rich DeCicco ON Amazon! It’s really nice to have finally created an album cover after so many years.